Hope, You are quite well and Preapation for the competitive Exams.West Bengal Board of Primary Education Recruitment 30000 Vacancies in School teacher in this years.So this a grate Opertunity for us.Now a days Most of the students are like to Primary teachers Job.Because Teachers job is the very interesting to us. But before the every Competitive Examination we need to proper Guidance more and more practice. 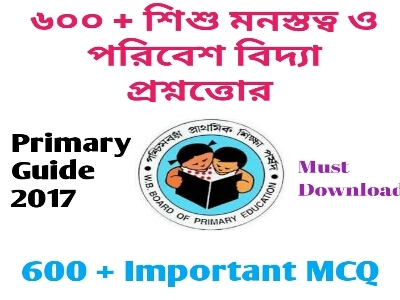 Here today GK Solve share a most important pdf file for the students who preparation for the West Bengal primary Teachers Job.Before the starting Practice, you need to know Syllabus and Question pattern of Primary Education. Then you can start practice regularly chapter wise. Child Development and Environmental science is very important to Primary teacher job Examination. and this the new topic for us. Child development is so much tough for most of the students.They can not understand, what they should doing.So they are unsuccessful this chapter.But GK Solve Help you to Solve this matter.Today GK Solve share 600+ Bengali MCQ with answer key of Child Development & Environmental Science.Download details of pdf file is given below.Hope this pdf file is most helpful to you.With this help you can more batter practice and crack the West Bengal Primary teacher Examination. GK Solve is the fastest Growing Education Website in West Bengal.You Can More the 180 important Study materials from this website.So readers If you help from this blog, please Daily Visit Our blog, Like Our facebook page and Share the blog Address to you facebook, whatsapp, telegram social friends group. We need your support.Thank you so much.